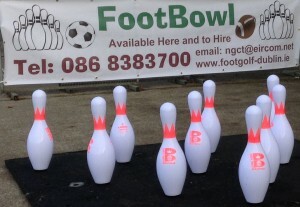 FootDarts has arrived at Newcastle Golf Centre Dublin, combining football and darts in a fun and easy! activity for all no matter what your skill or fitness level. Test your accuracy with FootDarts in Dublin. 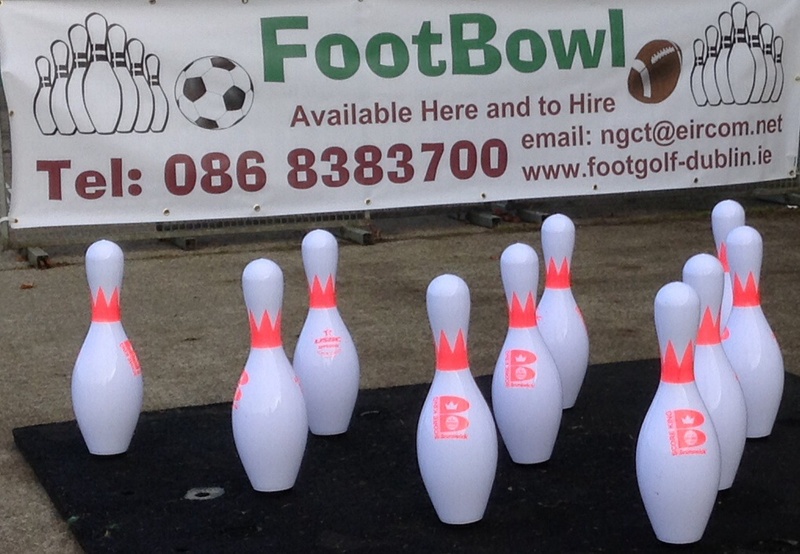 FootDarts Dublin at Newcastle Golf Centre . Score points by kicking the football at a giant inflatable dartboard. Or take aim at the bullseye to prove who has the best shot. In FootDarts players divide into teams and take turns to try to accurately land the ball on the board. You can play by the rules of darts and starting at 501 aim to score points with the first team to reach 0 declared the winner. Will you hit the bullseye! 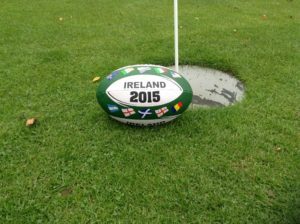 Have you ever imagined kicking a rugby ball on a golf course? 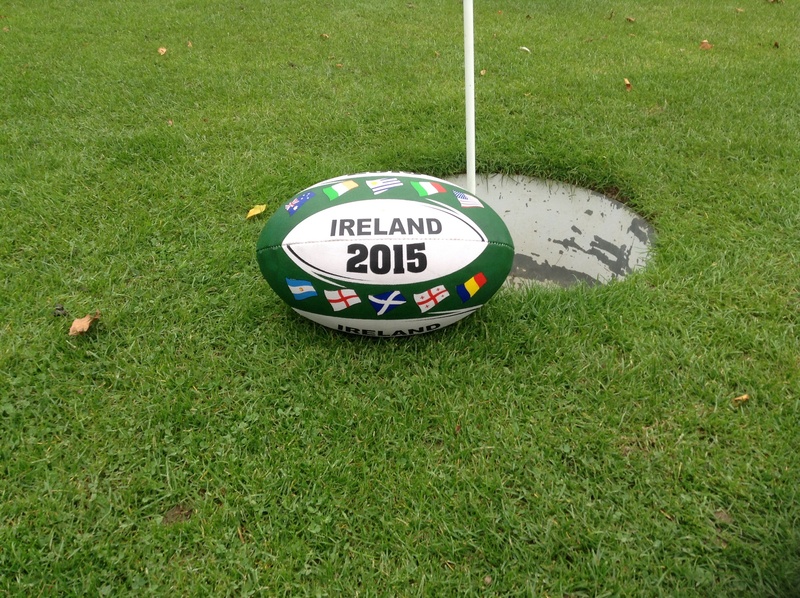 In 2015 we introduced rugby FootGolf at Ballybane to celebrate Ireland’s World Cup exploits. 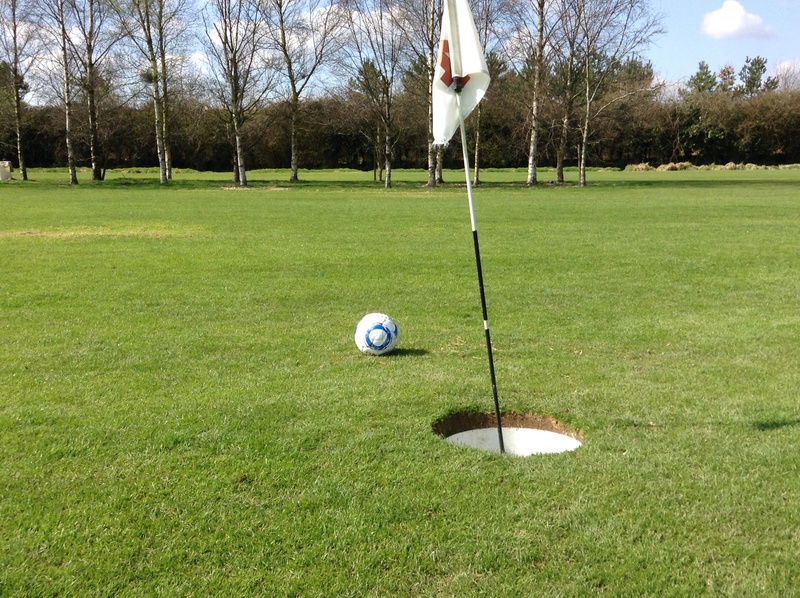 Since then rugby FootGolf has been available at Ballybane FootGolf. Played with the same rules as FootGolf the only difference is the shape of the ball. And herein lies the challenge! With FootGolf the ball generally rolls in one direction. In rugby FootGolf, once kicked, the destination of the ball is not so certain! A brilliant, fun activity for families, groups, stags, hens, team building, sports clubs and more Rugby FootGolf puts a new twist on the worlds fastest growing sport. Ballybane FootGolf is delighted to announce we now offer Laser Clay Shooting. How Laser Clay Shooting works: Shoot to thrill! Players fire authentic deactivated 12 gauge shotguns which are converted to fire harmless infra-red beams. Up to five players can shoot at the same time. A clay is released by the operator. When a shooter scores a hit, the beam is reflected back to the gun and registers a “HIT” on the scoreboard. Hit the clay, get the points! Authentic sound effects enhance the experience. 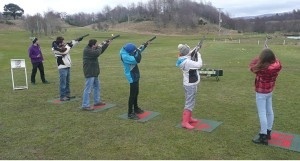 Laser Clay Shooting can cater for both small and large groups, and is great entertainment for team building, stag parties, hen parties, corporate days, sports clubs and more. Did you know Ballybane FootGolf was featured on RTE programme Don’t Tell the Bride! The show’s format consists of a couple who are given 10,000 Euro to spend on their wedding but they must spend three weeks apart without contact and the bridegroom must organise every aspect of the event and attire including the wedding dress, as well as the hen and stag parties, surprising the bride. 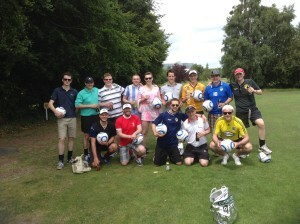 Ballybane FootGolf is an ideal location for your Stag or Hen party. In fact for any outing, corporate day, school tour, team building Ballybane FootGolf provides a great day of entertainment for all ages. We can even arrange for pizzas and chips to be delivered after your game to get your energy levels back up! So you’ve made the decision to get married. Now for the important decision…what to do for the stag or hen party in Dublin? FootGolf at Ballybane FootGolf Dublin. Try the most fun sport in the world, FootGolf! FootGolf is played on a golf course with the aim to kick a football from the teeing area and into the hole in the fewest number of kicks. It can be played by all skill levels and all fitness levels, you don’t have to be a Premier League footballer or Professional golfer to play the game and it takes less than 90 minutes to complete the course. At Ballybane FootGolf Dublin we’ve had stag and hen parties from all over Ireland – Dublin, Cork, Kerry, Galway, Sligo, Wexford, Kildare, Meath, Westmeath, Waterford, Carlow, Kilkenny, Donegal and more- and from overseas – Scotland, England, Wales, Germany, France, Hungary, Belgium and even the USA, Argentina and Brazil! The course is located only 25 minutes from Dublin City Centre and only 25 minutes from Dublin Airport. It is easily accessed from the N4 (Lucan exit), N7 (Grange Castle exit) and M50 motorways and only minutes from Lucan and Clondalkin villages. Whether you are travelling from Howth or Hollyhead, Kinsale or Killkenny, Ballybane FootGolf is well located in Dublin. Looking for food after the game? No problem. We can order food for you from the local takeaway with pizzas, chips, burgers and more available. Just let us know before you start if you want us to order food (deposit payment required before ordering). We also have a selection of sweets and refreshments available at reception. For a hen or stag it may be preferred to go to a restaurant or pub for food, if so we can recommend somewhere for you if you need some help. 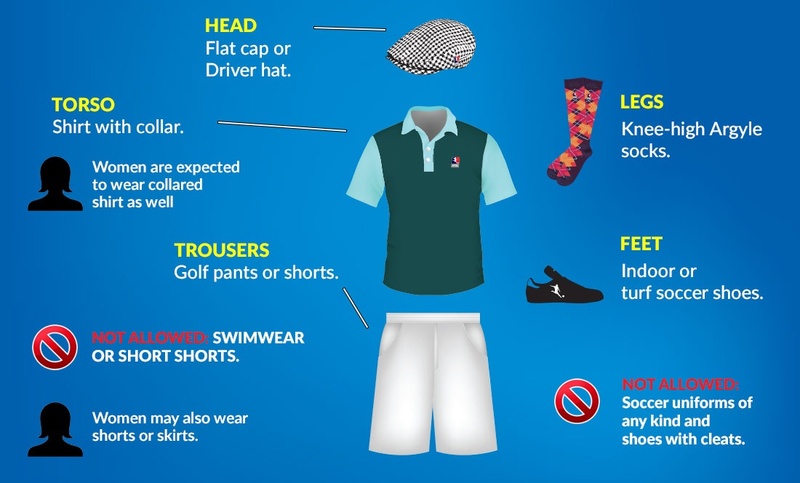 We do not have a strict dress code but if there is a particular unusual theme you are going with could you let us know, we may take some pictures for our Facebook page and website!! We want you to enjoy the day and would only ask that you respect any other footgolfers on the course. 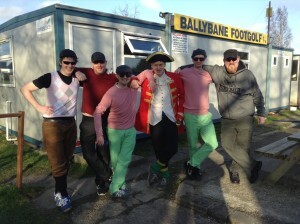 For fun days out, choose Ballybane FootGolf, the number 1 activity for stag and hen parties. If you require more information, directions or have any other requests please let us know.